Kramer Platforms is a bold new concept that goes far beyond standard ‘convergence.’ Introduced for the first time at ISE 2019, Kramer Platforms consist of hardware devices that are software-driven so one box serves multiple functions. It’s an innovative new way to lead AV designs with software and maximizing return on investment and customization options. 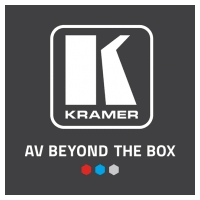 With Kramer Platforms, AV professionals can combine best-in-class solutions, such as Kramer’s VIA collaboration system with a Kramer Control brain. On display at ISE will be next-generation Kramer Control, a code-free, cloud-based control platform. Kramer Control provides unprecedented agility, allowing users to deploy control in any space, at a fraction of the time and cost. Kramer Network 3.0, an enterprise management platform enabling IT/AV professionals to easily configure and manage their entire Kramer product range, Dante™ devices and third-party devices from anywhere in the world. Kramer’s approach considers not only IT specifications, but also IT work methodologies, letting managers plan and deploy IT and AV systems in the same streamlined manner. This innovative platform is engineered for the IT manager. The result: less pain points, no silos. A positive user experience is essential for the reliable operation of an AV system. That’s why Kramer is investing heavily in sharing UX best practices in the AV industry. At ISE, the company will discuss how UX is a catalyst for new technologies. Committed to supporting technology managers and end users, Kramer is partnering with SCHOMS for a hosted buyer program focused on BYOD and collaboration. SCHOMS members lead and manage a diverse set of educational, technological, media and institutional development and support services. AV Magazine dynamic panel on Network Security will feature Kramer’s network and control expert, Keren Lipshitz. Date/Time: 8 Feb 2019, 15:00 – 16:00 (3pm-4pm). Location: Main Stage. AV Nation’s Tim Albright will moderate the session. Kramer will host a German Hosted Buyer Program and its Annual Cocktail Party at the Kramer stand 1-F20 (by invitation), on 6 Feb 2019, at 16:30 (4:30pm). Kramer’s resource library continues to grow with the addition of a new 8K whitepaper. This paper explores 8K “glass” and related challenges for transporting, switching, distributing, and interfacing 8K signals, due to their high clock and data rates. Download the whitepaper here: https://k.kramerav.com/academy/white-papers.asp. Visit Kramer at ISE 2019, February 5th-February 8th at booth F20, Hall 1. For information on all Kramer products and solutions, please visit: www.KramerAV.com.